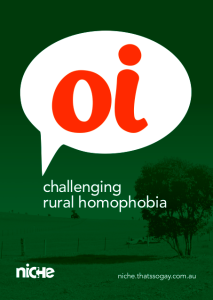 Even today, 20 years ‘Beyond Priscilla’, homophobia is still hurting rural Australia. The evidence is now beyond debate. 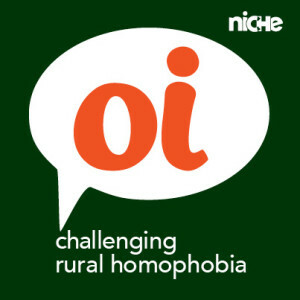 Communities talk about two things: rural youth suicide and young people having no choice but to leave their hometowns for the big smoke. Many people in rural communities – gay and straight – report that they feel uncomfortable about the way that people talk about and treat lesbian, gay, bisexual, transgender and intersex (LGBTI) people. Yet most of them don’t speak up, because they don’t know what to do or say. Young people in rural Australia all agree that what makes the biggest difference is whether the people around them support them or not. You can make a difference, no matter how small. We’ve had enough. It’s about bloody time we say ‘oi!’ to homophobia. If it’s safe, say something when you hear ‘fag’, ‘dyke’ and ‘so gay’. - That’s not OK around here. - I’m/we’re not OK with racism, sexism or homophobia. - Make sure they’re OK, and know they can get support from places like beyondblue, Kids Helpline and LifeLine.